Checked-In to the Clouds is a travel blog with the most exquisite sights you'll ever see in your browser. 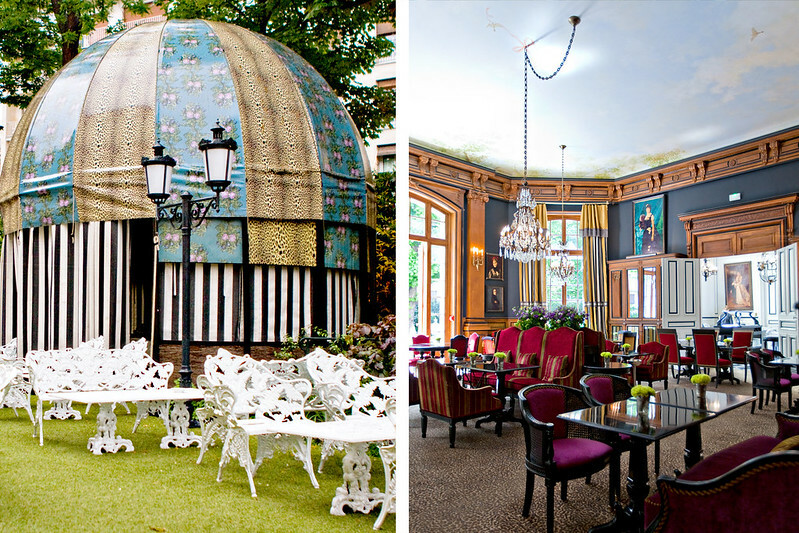 We have interesting photo coverage of the top sights, luxury hotels and the best restaurants in the world. Plus some bicycles and cars because they're cool too. Come check in with us! 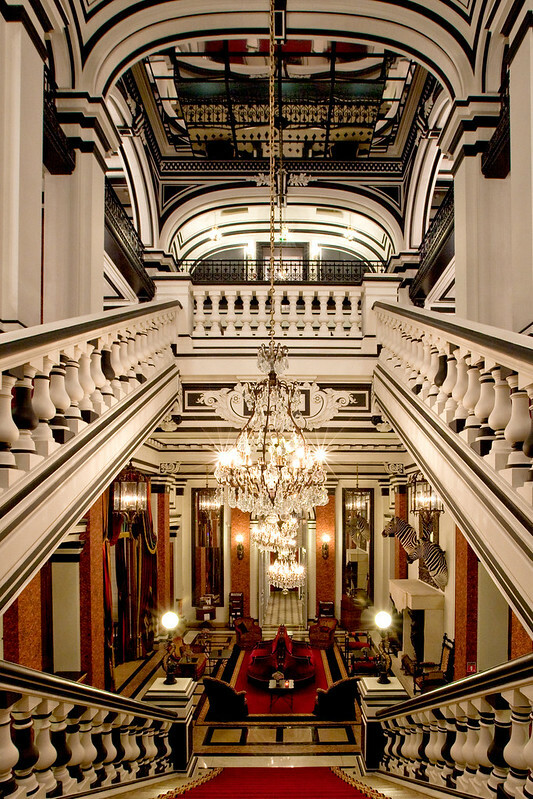 Check in to reviews of destination boutique and small luxury hotels . Photos of amenities and rooms. Locations include places we travel to in Europe; Amsterdam, The Netherlands, Paris, France, Copenhagen, Denmark, Stockholm, Helsinki, San Sebastian, Donostia, Girona, Madrid, Barcelona, Sevilla, Granada, Spain, Athens, Oia, Santorini, Greece, Brussels, Belgium, Zurich, Switzerland, Austria, Vienna, Marrakech, Morocco, Istanbul, Turkey, Rome, Sienna, Milan, Venice, Florence, Italy, London, England, Dubrovnik, Croatia, Lisbon, Portugal, Cancun, Mexico. 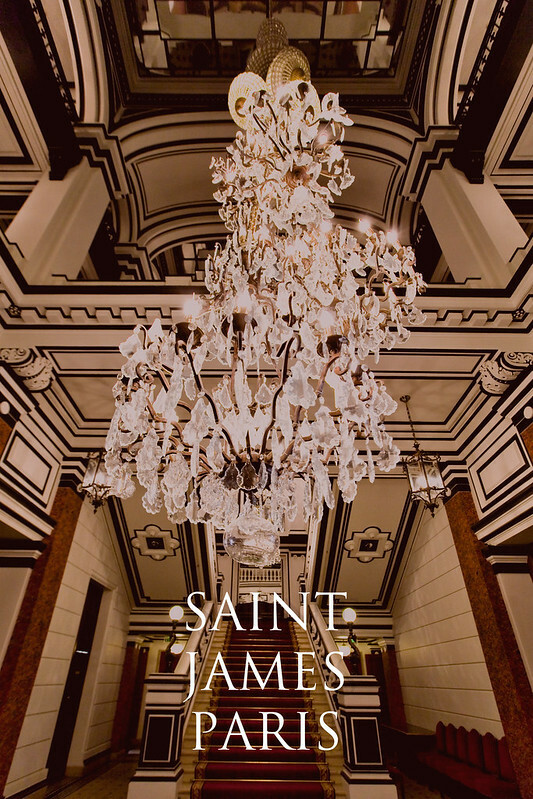 Saint James Paris, part of the exclusive Saint James Club, is a château turned luxury boutique hotel located in the nicely residential 16th arrondissement. 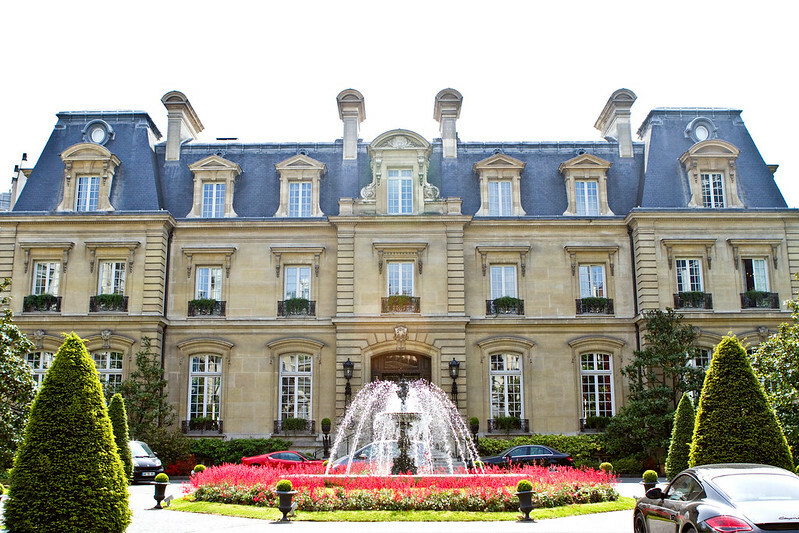 The château is steps away from the metro. In either direction, a 20-minute walk will get you to the Trocadéro or Arc de Triomphe. But, there are enough interesting details to keep you here your whole stay. The interiors have been decorated by Bambi Sloan. Known to be the "dream maker", she's taken queues from the château's history that includes Napoleon III furniture, animal print, and classic black and white contrasts. All of these apparent as you walk in its grand lobby with the 14-meter high chandelier that she calls "Chaos of Lights." Even if the dining room is darkly painted it is brightly lit by the huge portrait windows looking out at the hot air balloon in the garden. In contrast, the library is dimly lit. 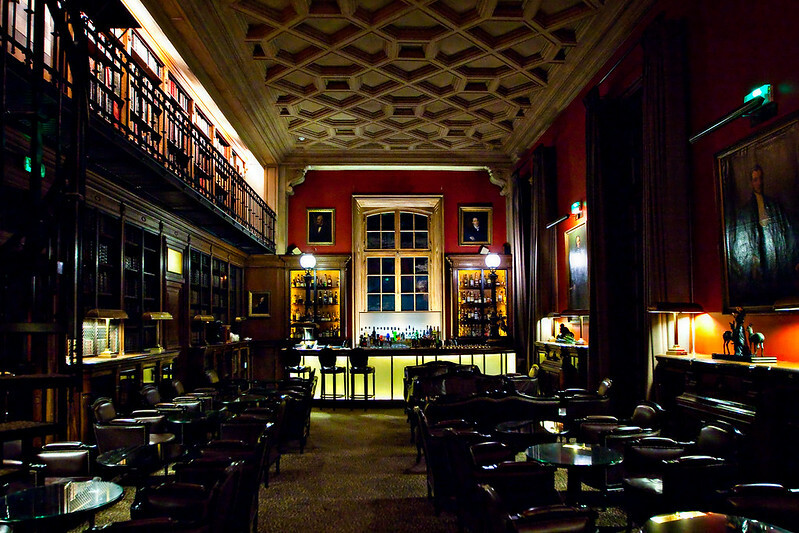 A bar has been added to the original library that still has over 12,000 books. 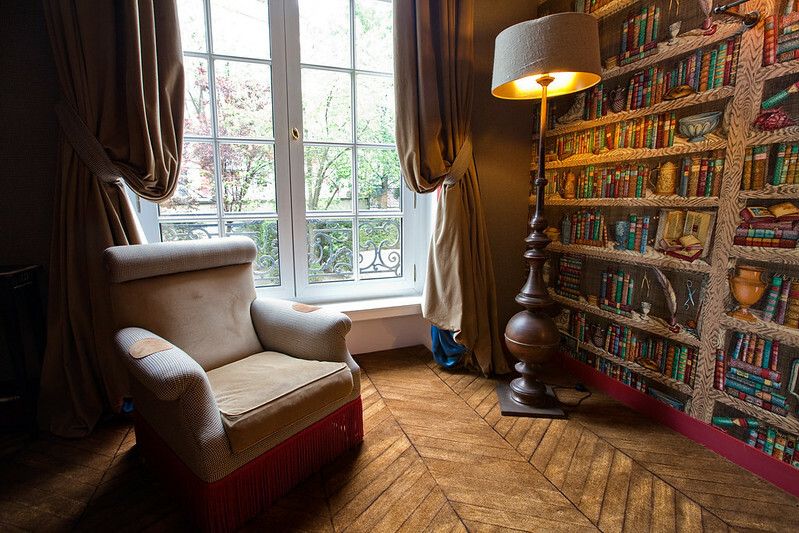 Leather chairs on leopard-print carpet are nestled in the volumes of leather-bound books. After you've had your night cap here, it's time to get some rest in one of its 48 suites. 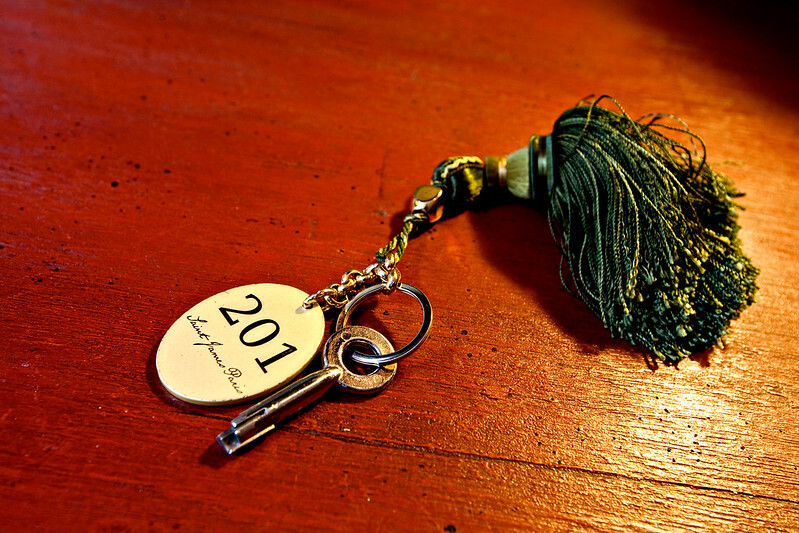 Room 201 is a Junior Suite. On the first floor you will find a spacious sitting room and study both luxuriously decorated in modern materials with an old world spin. 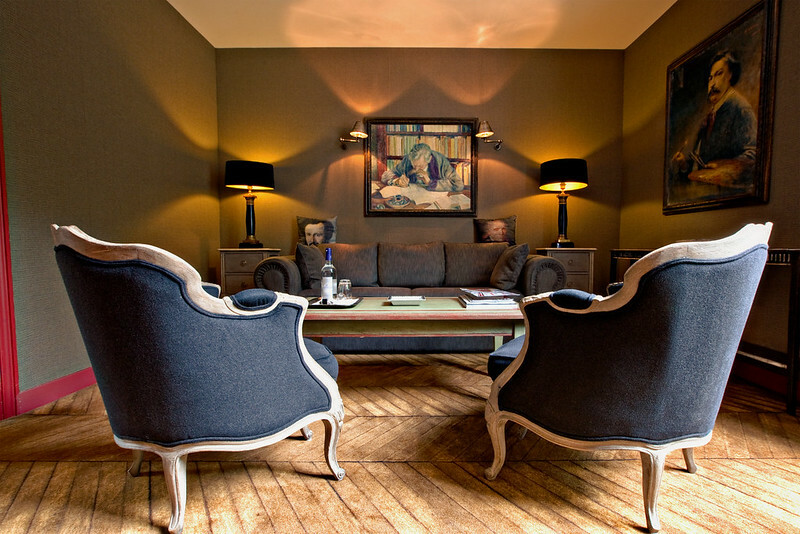 The carpet looks like wood parquet flooring and pillows covered with portraits of nobility adorn the sofa. 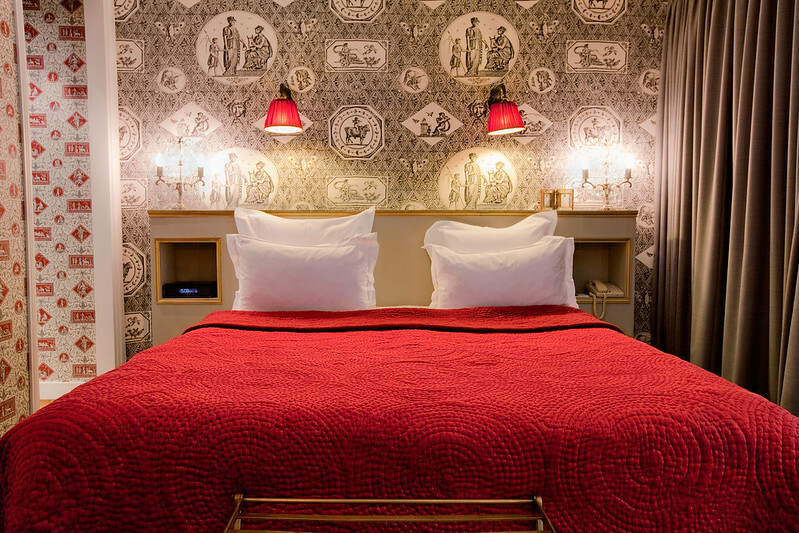 Up the spiral stair case is a soft and fluffy bed in a room wall-papered in fabric with ancient Greek scenes to provide inspiration for you adventurous dreamers. 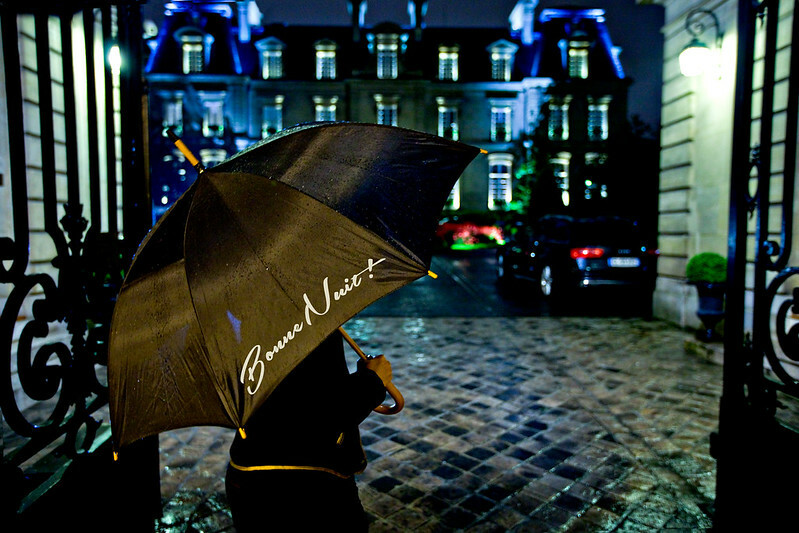 Dreaming or strolling, a rainy night in Paris is good for either. © 2013 Checked-In to the Clouds, all rights reserved.